Why Low T3 + T4 Can Trigger Thyroid Hair Loss? Your hair is an excellent barometer of how well your thyroid is working. If you are concerned about your hair getting thin, or are noticing a greater amount of hair loss the root cause could be your thyroid. Thyroid hair loss is one of the most common and distressing signs of a low thyroid. Hair loss linked to an under active thyroid causes hair loss from all areas of the scalp. It may even lead to noticeable thinning of the hair, and bald patches in extreme cases. You should also check in the mirror to see if the outer third of your eyebrow is missing. It’s a classic hypothyroid sign practitioners look for. Why does your hair fall out? The thyroid hormones fuel day to day function of the hair follicles. This means a drop in thyroid hormone levels can trigger a significant amount of hair loss. A landmark study published in The Journal of Clinical Endocrinology and Metabolism established this important link between thyroid health and hair loss. The researchers studied human scalp tissue taken from people who had undergone recent plastic surgery. They investigated how the key thyroid hormones thyroxine (T4) and triiodothyronine (T3) directly target the hair follicles. The research revealed the thyroid hormones play an important role in regulating the natural growth and shedding cycles of hair. Most importantly the thyroid hormones slow the release of hair from the scalp and activate the growth of new hair. If you have experienced a drop in your thyroid hormone levels a return to healthy levels of T3 and T4 will help revitalise the hair follicles. 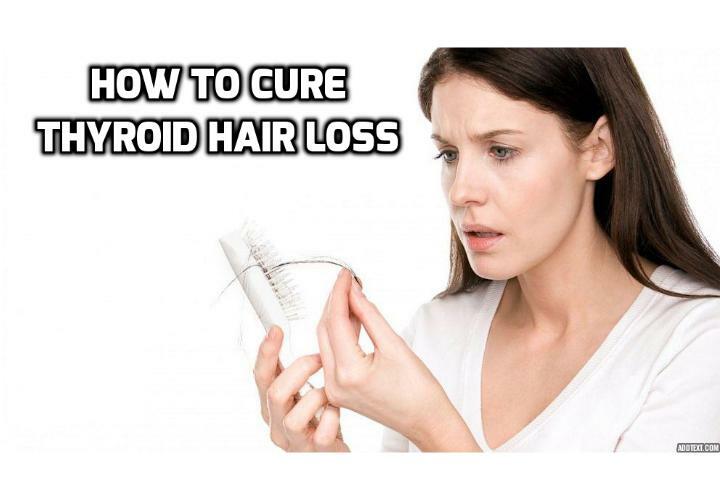 Over time this will put a halt to thyroid hair loss. We all know stress is not good for overall health. When it comes to thyroid health, too much stress slows thyroid function. Many individuals suffer sudden, or greater thyroid hair loss soon after experiencing high amounts of stress. Extreme emotional stress, childbirth, surgery, or severe infections are just some of the stresses that can have a negative impact on your thyroid. A drop in circulating thyroid hormone levels can set off a range of hypothyroid symptoms. It may surprise you to learn that premature greying of hair also indicates low thyroid hormone activity. The thyroid hormones stimulate melanin production within the hair follicles. Melanin is naturally produced to give colour to both your skin and hair. When melanin levels drop it causes the hair to turn grey. The connection between a drop in thyroid function and early greying of the hair is often missed. This type of baldness is due to a hormone imbalance. There is usually an increase in androgens, the male type hormones that should only be present in small amounts in women. When women have excessive levels of androgens it stimulates male type baldness. This is the type of baldness commonly seen in men. If you are worried about hair loss it is important to discuss thyroid testing with your healthcare practitioner. The top 5 thyroid tests I recommend include; thyroid stimulating hormone (TSH), free T4, free T3, reverse T3, and a measure of thyroid antibody levels. Checking your free T3 levels is particularly important and I recommend you take a close look at your T3 levels. You want to see this thyroid hormone in the mid, or upper level of the healthy range. Treating an underlying thyroid disorder is an important step to improving your hair health. As thyroid hormone activity improves, especially T3 it is usual to see improvements in your hair health. This means you should see improvements in both the appearance of your hair and less visible hair loss. A nutritious diet, specific nutrients and lifestyle modifications can greatly assist healthy thyroid function. You may also need to speak to your doctor about taking a prescribed T4/T3 thyroid medication. Note: There can be other reasons women shed hair more than normal. It may be best to discuss your concerns with your healthcare practitioner so they can investigate further. How effective is thyroxine for hypothyrodism? Thyroid health and mood – Do thyroid problems affect your mood? Is there a strong link between strong bones and healthy parathyroid glands? Previous PostPrevious Can Basal Temperature Testing Help Diagnosis A Thyroid Problem? Next PostNext Should You Get a T3 Test If You Find It Hard to Lose Weight?